Nascar racing diecasts were not produced until 1989 on a massive scale. Before 1989 a few nascar diecasts were produced by Hot Wheels with only the car sponsor graphics and no driver names. Some promotional nascar diecasts were produced here and there but few and far between. Dale Earnhardt had a promo Nascar diecast produced but good luck finding it. The Racing Collectables Club Of America a fan based pay to join club was the first company based in Georgia to sell Nascar collectables but not diecast reproductions until a man named Fred Wagenhals purchased the rights to sell Dale Earnhardts name on a diecast toy car for $300,000. These cars were marketed first through this Georgia based company not owned by Fred Wagenhals until later down the road. Fred Wagenhals then hooked up with different partners outside of the "Racing Collectables Club Of America" and created the brand, "Racing Champions". Between 1991 and 1995 The Racing Collectables Club Of America sold thousands of past Nascar diecast replicas modeled after Nascar race cars from the 1960's. Racing Champions produced some top Nascar driver cars without the sponsorship logos. The driver names were added to the products but only the driver names and car numbers. The rights to reproduce some driver names were purchased for the top name drivers back then but not the rights to reproduce the sponsors. Early Nascar diecasts without the sponsors branding on the Nascar diecasts are the first Nascar racing diecasts to be released. Racing Champions was sold to the Japanese company Tomy in 2011. Fred Wagenhals formed "Action Products" in 1986 and sold Radio Controlled Models and Go Carts through Action Products. After Wagenhals success in selling Nascar diecast replicas through the Racing Collectables Club Of America and Racing Champions Wagenhals shut down "Action Products" and created "Action Racing Collectables" in 1992. "Action Racing Collectables" was formed after Action Products failed and Action Racing Collectables got started off with a bang producing Nascar diecast car replicas. Action Racing Collectables after startup started buying up rival Nascar Diecast companies until they owned just about the whole Nascar product market. Now Action Racing Collectables along with all the companies Action brought up belong to Lionel Trains. "Winners Circle" formed in 1996 with the help of Action Racing Collectables as an investor and was majority owned by Hasbro. Winners circle only sold products on cardboard through retailers like Walmart and Target. Winners Circle eventually was sold out by Hasbro to Action Racing Collectables completely in 2001 when Actions logo started appearing on Winner Circle products. In 2010 the Winners Circle brand was discontinued. In 2012 the Winners Circle brand was renamed "Nascar Authentics" and started to be produced again. Revell Nascar diecasts also started to appear in 1994 but the Nascar division of Revell was bought up by Action Racing Collectables a couple of years after startup and Revell Nascar were as far as I know only produced in 1994 thru 1997. I have seen some 1998 Revell Nascar diecasts but these 1998 Revell diecasts were produced by Action Racing Collectables. Any Revell after 1997 would be owned by Action Racing Collectables. Hot wheels got into the game in 1996 when they signed Kyle Petty to host their Hot Wheels paint scheme in an advance promotion to kick off their Nascar diecast product line. It worked. Everyone was excited about the new Hot Wheel sponsor car even though Kyle Petty was a hot driver and was only well known because of the Petty name. In 1997 the first Hot Wheels Nascar diecasts started to appear with Kyle Petty being the primary diecast racing car to be released. By this time Action Racing Collectables had most of the top drivers locked down so Hot Wheels could only reproduce the leftovers. Racing Champions had split from Action and was left with only not so popular drivers. 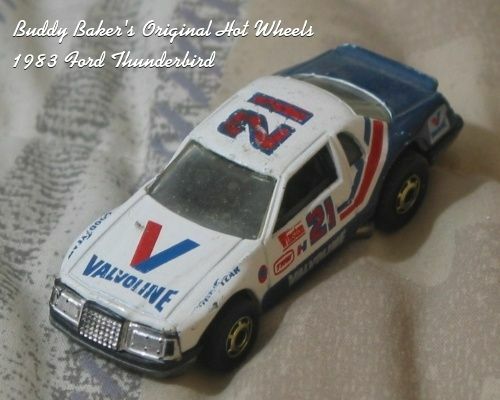 Statement From Author: If your collecting Nascar diecasts for value then collecting the Nascar diecasts between the years 1989 and 1997 would be your best target because after 1997 Action Racing Collectables controlled the whole diecast marketplace and began condensing the marketplace for profit. Before 1998 other companies had a share of the pie. Nascar diecasts are valued at drivers performance and popularity but some value will come from past companies diecasts becoming rarer and rarer over the years. Right now these past company produced diecasts can be found readily as they are being dumped for 2 to 3 dollars on Ebay but I have seen many sellers slowly increase the prices of these pre 1998 diecasts just as a matter of age. Not to many people at the time this article was written understand Action Racing Collectables owns the Nascar diecast market completely now and companies like Hasbro and Revell have been gone since 1998 and are not producing Nascar diecasts anymore. Racing Champions was sold to a Japanese company in 2011. I have not researched how many drivers Racing Champions was allowed to produce and at what point in time Racing Champions lost its licensing on drivers. 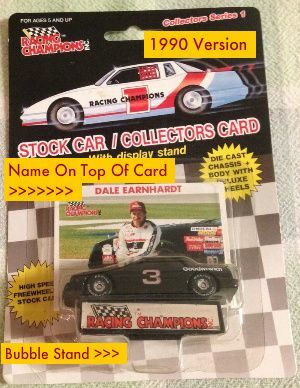 I do remember when Racing Champions lost its licensing rights to produce Dale Earnhardt diecast back in the 1990's. I don't remember what ever came of that. Watch the diecasts produced from 1989 thru 1997. This is the Nascar diecast hayday! Most of the information in this article is very accurate but some statements may be inaccurate but close to accurate. Accurate information will be updated on the inaccurate statements as the accurate information is found. The Wikipedia page on Nascar diecasts is all over the place with very little information that can be relied on.